Lady of Fortune, PlayNGo’s luck-themed slot, comes with multipliers, a lucrative bonus game, and a top fixed payout of 2,500 coins. 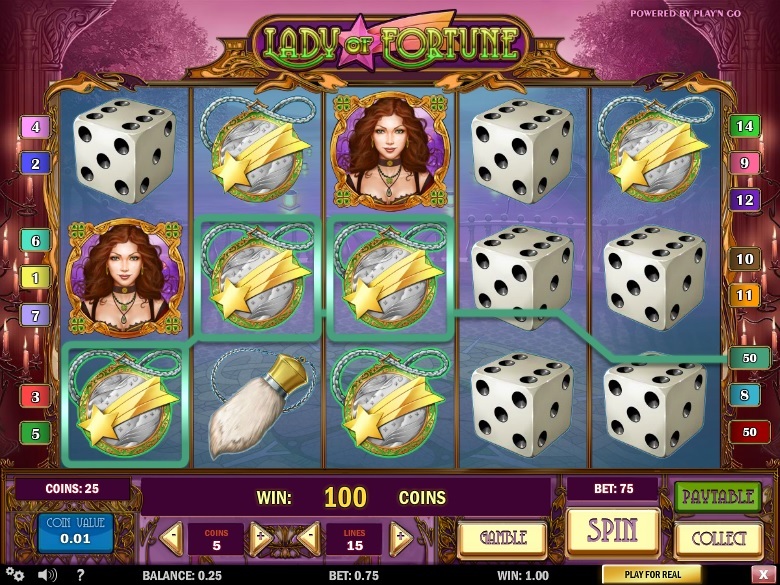 Since Lady of Fortune is based on standard slot rules, it is fun and easy to play. The slot has 15 paylines, and in order to start playing, players should first activate as many or as few of the paylines as they wish. They can do this by clicking on the plus and minus signs on the Lines options. Players can bet up to 5 coins per active by clicking on the plus and minus signs on the Coins button. They should then choose from coin values ranging from $0.01 to $0.25. The betting range for this slot is therefore $0.01 to $18.75. Daring players can bet maximum by hitting on the Bet Max option. The next step is to hit the Spin button to set the reels spinning. If a winning combination is seen at the end of one spin of the reels, players will receive payouts according to the game’s pay table. The slot also comes with an Autoplay feature, which allows players to spin the reels automatically. PlayNGo’s Lady of Fortune is based on the famous theme of good luck and fortune. The slot’s ambience music is charming, the graphics are brilliant, and the game play is smooth. The reels feature lucky symbols such as Ladybug, Four Leaf Clover, Horseshoe, Seven, and so on. Interestingly, people in most countries around the world consider these symbols to be lucky. The slot therefore appeals to players all over the world. The most lucrative symbol in Lady of Fortune is the Seven. If players spin a combination of five Seven symbols along an active payline, they will win the top fixed jackpot of 2,500 coins. The second-biggest fixed payout of 1,000 coins can be won by landing five Four Leaf Clover symbols along an active payline. The slot’s Golden symbol is the wild, giving players plenty of opportunities to complete winning combinations and win payouts. On the downside, the Golden wild symbol appears only on the third reel. If it helps players finish a winning combination, the payout for that combination will be multiplied by random multiplier values of x2, x3, x4, or x5. The Lady of Fortune symbol is the scatter, but it appears only on the first, third, and fifth reels. If players land a combination of three Lady of Fortune symbols on these reels, the bonus game gets activated. Players will then be prompted to click on any Lady of Fortune symbol to reveal bonus cash prizes of up to x150. Lady of Fortune is a simple slot, uncluttered with too many bonus features. Players can play it on desktops as well as smartphones and tablets.